Abstract: Herein we report the synthesis and structures of two new small-pore aluminophosphate molecular sieves PST-13 and PST-14 with mutually connected 8-ring channels. The structure of PST-13, synthesized using diethylamine as an organic structure-directing agent, contains penta-coordinated framework Al atoms bridged by hydroxy groups and thus edge-sharing 3- and 5-rings. Upon calcination, PST-13 undergoes a transformation to PST-14 with loss of bridging hydroxyl groups and occluded organic species. The structures of both materials consist “nonjointly” of pairs of previously undiscovered 1,5- and 1,6-open double 4-rings (d4rs) which are mirror images of each other. 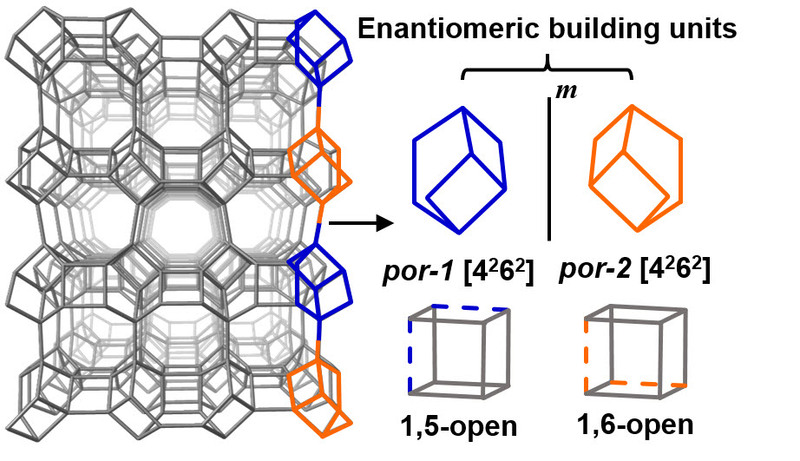 We also present a series of novel chemically feasible hypothetical structures built from 1-open d4r (sti) or 1,3-open d4r (nsc) units, as well as from these two enantiomeric structural building units. The structures of PST-13 and PST-14, two small-pore aluminophosphate molecular sieves, were found to consist of pairs of enantiomeric structural building units, i.e., tetrahedral () 1,5- and 1,6-open double 4-rings.